This is a great western team building game or prop. Challengers step up and try to out-milk each other. Cow milking competitions are popular at carnivals, fairs and festivals for years and it can now be played without an actual cow. Our Inflatable cow milking game is 10 feet tall and comes complete with cow milking bucket. All you have to do is fill the utter bucket with liquid like water, milk, lemonaid or whatever and let the cow milking games begin. Country folks and city-slickers will have lots of fun with this larger than life 10 foot tall Inflatable Cow Milking Game. It can be played by one person using a timer or two contestants in “hand to hand” combat. 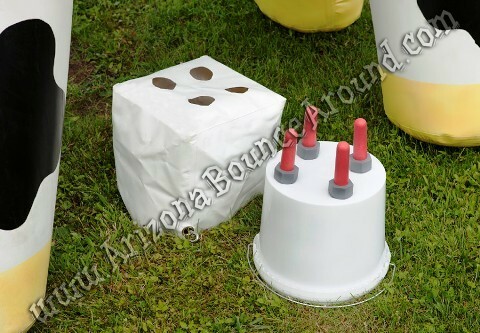 Our Cow Milking game is a sealed air inflatable cow that stays inflated without noise during your event so rent its the perfect western game or western prop for indoor or outdoor events. Get more information about western themed parties by checking out our party theme page. This cow milking game will be utterly fun at any western themed party or event.